The Manuscript Collection of the National Library of Thailand is the country’s largest collection of old handwritten documents, totaling several hundred thousand titles. These consist primarily of palm leaf manuscripts, various kinds of paper manuscripts, and facsimiles of inscriptions. The Manuscript Collection does not include printed books, which can be found in the National Library’s rare books collection or its main stacks. Likewise, researchers are advised to see the National Archives of Thailand for typed, printed, and (some) handwritten administrative documents from the Fifth Reign (1868-1910), administrative documents in any media from the Sixth Reign onward, and photographs from every period. The Manuscript Collection is broadly divided into three major divisions: inscription facsimiles, palm leaf manuscripts, and paper manuscripts. Most of the actual inscriptions are stored at the National Museum’s warehouses. The National Library’s Manuscript Collection instead holds rubbings, transcriptions, and other facsimile versions of at least 10,000 originals, which were inscribed not only on stone but also onto gold or silver sheets, bricks, wood, the bases of Buddha images, and so on. I have not used this collection myself, but I was told that research access to the collection of inscription facsimiles is more difficult than to the manuscripts. Interested researchers, either Thai or foreign, may have to demonstrate prior training in epigraphy. Fortunately, however, digital images, transliterations, and translations of many of these inscriptions are now available online at http://www.sac.or.th/databases/inscriptions/. The division of the manuscripts by media into palm leaf and paper categories roughly corresponds to content: most palm leaf manuscripts are Buddhist texts, while most secular or state documents in Thai were written on paper media. There are, however, exceptions to both generalizations. Most of the manuscripts date to the nineteenth century, but there are a small number that are older and a good many, especially among the palm leaf manuscripts, are newer. The Manuscript Collection contains approximately 250,000 palm leaf manuscripts. The palm leaf manuscripts are arranged first by script: into Thai, Khom, Tham Lanna, Tham Isan, Mon, and so on. Within each script category, texts are arranged alphabetically by title or content (i.e., a title assigned by the library staff), and may be written in Pali, a local language, or a combination. 2) Administrative documents [จดหมายเหตุ], arranged chronologically by year. 4) Chronicle history [พงศาวดาร], divided geographically by the ethno-region of the chronicle subject: Thai, Northern Thai, Lao, Khmer, Lankan, Mon, Chinese, etc. 5) Manuals [ตำรา], divided into pictorial, animal, astronomical and calendrical, war, magical, miscellaneous, metallurgical, medicinal, and astrological sub-categories. 6) Tamnan history [ตำนาน], i.e., the popular, often legendary histories of Buddha images, stupas, and so on. 7) Texts on royal ceremonies [พระราชพิธี]. 8) Texts on Buddhist teachings [ธรรมคดี]. This is where Buddhist texts written on paper, not palm leaves, are categorized. These titles tend to be extra-canonical. 9) Texts on composition and poetics [อักษรศาสตร์]. 10) Biographies [ประวัติ], including genealogical texts as well as short historical accounts centered on particular individuals or places. 12) Literature [วรรณคดี], divided by type of poetic meter and/or genre. 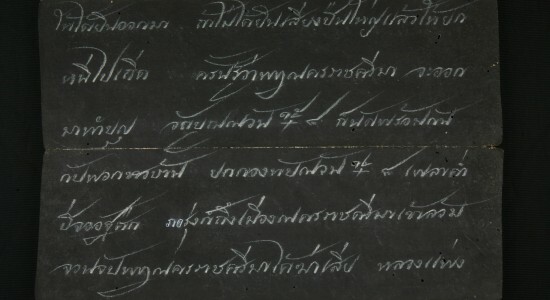 13) Draft inscriptions [ร่างจารึก], compositions of inscription texts made in preparation for the actual inscribing. This system of categories was developed in the early twentieth century to organize a collection of mostly-older texts, so there is a lot of overlap and the librarians, over the years, have had to make some difficult decisions about where certain manuscripts should be placed. Indeed, sometimes a single manuscript might include narratives on several different topics, composed perhaps in different years, but it can only be located in one place (and there is very little cross-referencing). Any researcher with enough time would be rewarded by looking at as many of these categories of texts as possible. In my interview with the library staff, I learned that only a fraction of the paper manuscripts held by the library are currently accessible to researchers. Almost all of the 30,000 samut thai titles have been categorized and made available by the library staff. However, the vast majority of the 60,000-some kradat phlao, mostly from the Fourth and Fifth Reigns (1851-1910), have not yet been organized and remain unavailable to researchers. This is a vast collection of official correspondence between Bangkok and the provinces that, unfortunately, still remains out of reach. In addition, the library staff has decided, over the years, that approximately twenty percent of the categorized paper manuscripts in the administrative documents section are not suitable for public viewing. These principally touch on foreign relations. The worry is that rude early-to-mid-nineteenth century comments about, for instance, Lao, Khmer, and Vietnamese, or records of brutal treatment at the hands of Siam’s armies, could threaten bilateral relations today. In addition, there are also more than a few manuscripts that could be read as insulting to the Thai royal family. While most of these restricted manuscripts would fall into the administrative documents category, some would come from other categories, such as literature, as well. I was told that decisions to restrict access to these manuscripts were not made with the intention to impede historical research, but rather to guard against legal or intra-governmental problems. Most of the restrictions are not new—in his dissertation, for example, David Chandler lamented a decision made by the library in 1970 to restrict access to much of the Third Reign correspondence regarding Cambodia—but researchers should be advised that the number of restricted documents is substantial. It is also difficult to get a sense of just what documents have been made unavailable, as even their titles have not been made public. However, the collection of accessible manuscripts is still vast (and still contains plenty of blunt comments about Siam’s neighbors). Titles have been assigned to all of the Manuscript Collection’s publically-available palm leaf and paper manuscripts. Titles of palm leaf manuscripts can be browsed in a large card catalog cabinet, while titles of paper manuscripts have been either typed or handwritten in a series of ledger books corresponding to the thirteen topical categories outlined above. Users are required to compile a list of all the documents they wish to see, and submit it as part of their application to gain access to the research collection. Unfortunately, these lists of titles are not online, nor even in an electronically-searchable form on site (and of course they are in Thai), so even the process of compiling the list of desired texts can take a while. Although official permission is not required to look just at the ledgers, in anticipation of the next step the staff may ask users about their research topics and institutional affiliations. In addition to the NRCT letter (for foreigners) and the list of documents the researcher would like to see, the application form also requires the researcher to specify his or her research topic and sponsoring institution. (Thai citizens without a government or educational affiliation can apply for access for only three months at a time.) The Manuscript Collection’s staff then forwards the application to the library administration and the Ministry of Culture, and approval is likely within a few working days. Unless the research topic is framed in unusually provocative terms, I do not think there is much risk of a rejection of the user’s application at this stage. Aside from public holidays and the occasional staff retreat, the collection’s reading room is open Monday through Friday from 9am to 4pm. Users may request to see documents from their approved list in any order they like. (It may be possible to see texts not on one’s initial list, but if a user wishes to see a great number of additional texts, a new application might be required.) The short call slip makes space to list five documents, which is probably a reasonable number to request to see at any given time. However, the staff is usually willing to bring out more if the researcher needs to, for example, compare more than five similar texts. Researchers are welcome to continue working through the noon to 1pm lunch hour, but they cannot request to see new manuscripts during that time because there is only a skeleton staff working while the others are at lunch. In order to help preserve the original manuscripts and to facilitate their use and reproduction, facsimiles have been made of many of them—probably even most of the paper ones. These vary from handwritten or typed transcriptions to microfilms, electronic images, and photocopies. To help preserve the originals, the staff will generally provide researchers with facsimiles of documents, when available, by default. However, if the researcher has good reason to want to see an original, the staff is usually willing to oblige. If the researcher wants to see a great many of the originals instead of the facsimile versions, they may have to request formal permission. Although no one will be bothered to see you (silently) using a smart phone in the Manuscript Collection’s reading room, it is strictly prohibited to take photographs or scans of documents with mobile phones or cameras. Copies of documents can be ordered, however. Photocopies of manuscripts or facsimiles on Western-style paper are three baht per page. Microfilm print-outs can be made for ten baht per “screen,” and users can obtain high-quality digital photographs of original manuscripts for 30 baht per frame (generally, a frame is two pages of a samut thai manuscript, or one side of six palm leaves). The digital images are taken by staff in another section of the library, and the turn-around time depends on their schedules and the number of duplications requested. The Manuscript Collection is located on the fourth floor of the new building, through and behind the main library. (While the main building is currently closed for renovation, the new building is still open.) The collection’s reading room is spacious, air conditioned, and bright, and there are rarely more than one or two researchers present. It is, however, a favorite destination for school groups, and so users must be prepared for a temporary racket from time to time. And if they are foreign researchers, they can expect tour groups to treat them, politely, as one of the exhibits. As of last year, the National Library now has wifi. In the reading room, however, the signal is rather weak. Researchers are welcome to bring in laptops, backpacks, mobile phones, and reference materials. They have to submit backpacks and handbags to searches at the entrance to the main library, and must fill out a brief form before bringing in their own books. This is so that when they leave at the end of the day, their personal books are not mistaken for library books. As it is a Thai government institution, users are also expected to dress politely. The library is located on the corner of Samsen and Sri Ayutthaya roads. Taxi drivers, if they are not sure where the library is, should at least be familiar with the Thewet Market around the corner. From the Ratchathewi skytrain station, bus 16 goes directly to Thewet, and sometimes onwards past the library. Thewet also hosts a Chaophraya river boat stop. There are inexpensive Thai restaurants and street food stalls in all directions, and for a nicer lunch the nearby restaurant Khrua Apson is justifiably well-regarded. In short, the collections are remarkable, the atmosphere is conducive to research, and the staff is professional and efficient. It is my hope that more researchers will begin to make use of these collections in the future.